Need a quick and easy way to creatively decorate cakes? 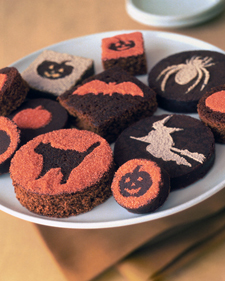 Get these great Halloween Cake Stencils from Martha.com and transform your cakes from sweet to scary treats. Remember to use colored sugar sprinkles and powder sugar to make spooktakular looking cakes and cupcakes. This entry was posted in Cake, Halloween and tagged baking, Cakes, Decorations, Halloween, Martha Stewart, themes. Bookmark the permalink.